A female artist in New York City made these “household fetishes” in the early 1960s. Tired of always having to do the housework and other mundane daily chores when she was under deadlines to finish her artwork, she enlisted the help of a neighbor, who was referred to by everyone in the East Village as “The Shaman,” to help her make these magical tools. 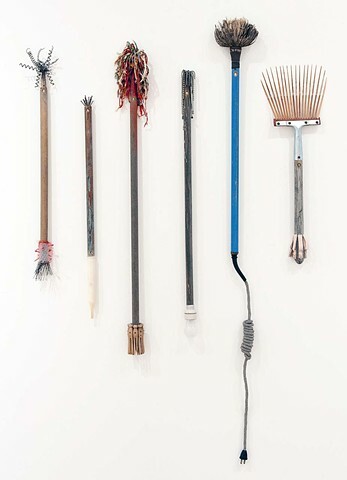 When frustrated by any of the nagging tasks that got in the way of her artistic production, she would shake the particular fetish sticks needed to take care of the chore. The fetishes seldom actually worked, but they somehow made her feel less aggravated and more in control.